Swifts flying by my house. Perhaps a give-away putting this picture first, before telling the story below, but I thought it was such a nice picture. Indeed it's after I succeeded in attracting swifts. Already going dark, with the crescent moon in the sky, exposure 1/320 sec at f5.6 (ISO 800) fails to stop the motion of the birds (hardly surprising!) - I think the motion adds to the scene. By now, there were swifts nesting in several of the boxes shown. See Table of dates for dates of egg-laying, hatching, fledging for all years. 2019 Swift diary - no news yet, as still about 3 months until swifts arrive in May. 2018 Swift diary - cameras in three boxes this year, plus reports on the other nest-spaces. 2017 Swift diary - cameras in two of the boxes again, with a more 'zoomed-in' view than in previous years, and later a camera in one of the gable-end boxes, plus reports on the other nest-spaces. 2016 Swift diary - cameras in the usual two boxes again, and now 6 new boxes in the loft with access through the gable end. 2 chicks raised in each of the two camera boxes, and (probably) 5 other breeding pairs, including 1 in the new gable end boxes. 2015 Swift diary - cameras in the same two boxes as last year. 3 chicks raised in each of the two camera boxes, and 4 other breeding pairs. 2014 Swift diary - two pairs breeding on camera, and 5 other pairs either breeding or prospecting. 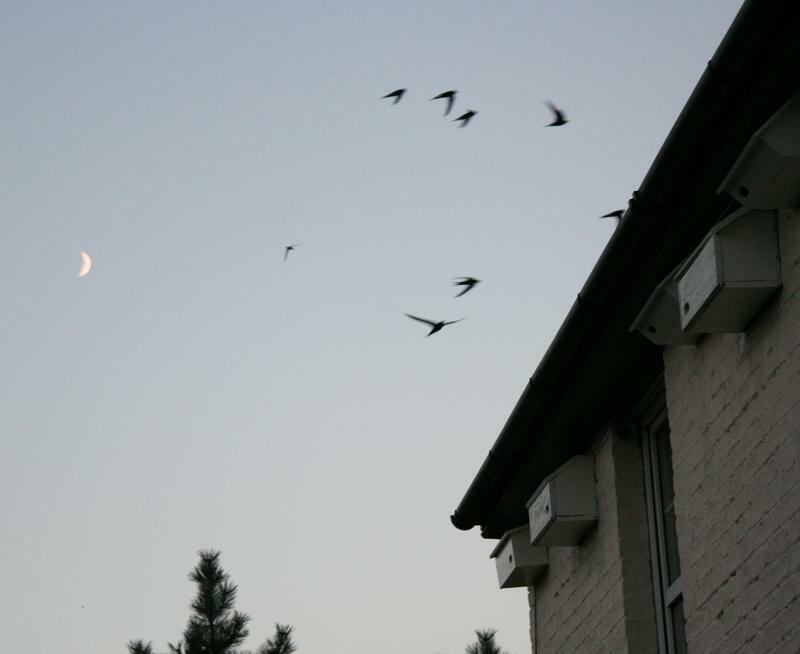 2013 Swift diary - now with video camera, swifts raise 3 young, and others find new spaces. 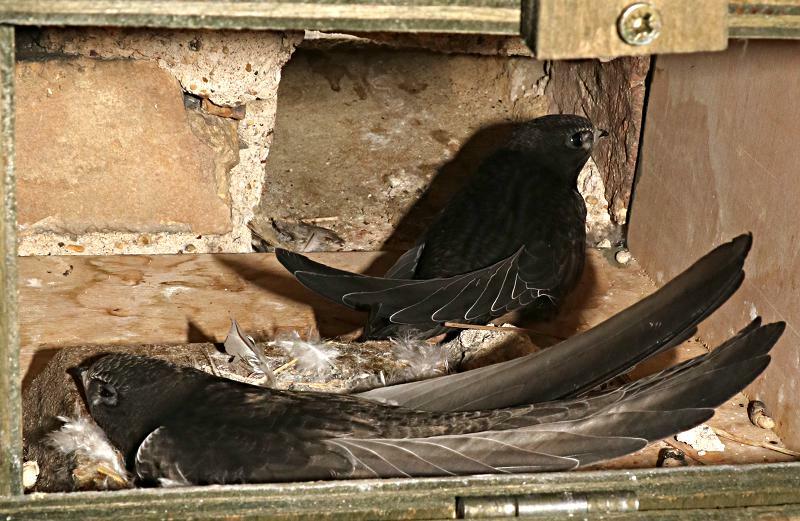 2012 Swift diary - swifts return and breed. 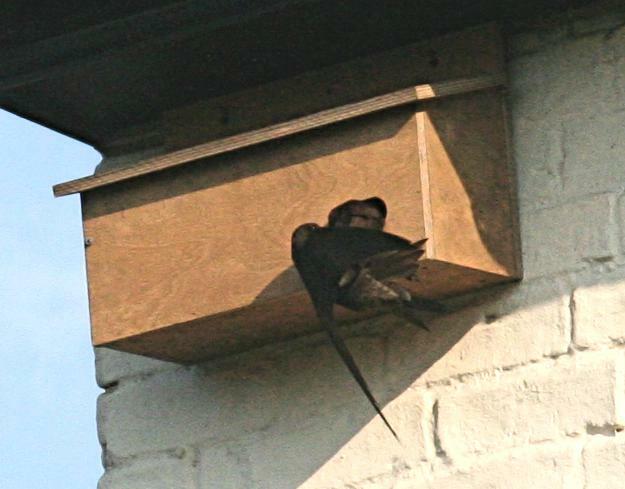 2011 Swift diary - swifts enter a nestbox for the first time. I moved from a house in the city of Cambridge to a village just outside in early 2006. That first summer, I couldn't help but notice the birds 'screaming' in parties as they flew by, with their calls fading into the darkening sky as night fell. Swifts - it turned out. I didn't even know what they were at the time. They must have been there when I was in Cambridge, indeed I've seen and heard plenty in the city since, but somehow I'd never noticed them. Secondly, the house came equipped with two strange boxes attached high on the wall. The previous owners said they didn't know what they were intended for - they'd been there when they bought the house. I started researching swifts: Swift Conservation was the main site I read (it used to be called "London's Swifts"). There are many sites, but another, particularly local to this area, is Action for Swifts. I found from these sites that the two boxes on the wall were precisely the "Hirsel" design of nestbox for swifts (as installed many years ago at The Hirsel, in Coldstream, Scottish borders). 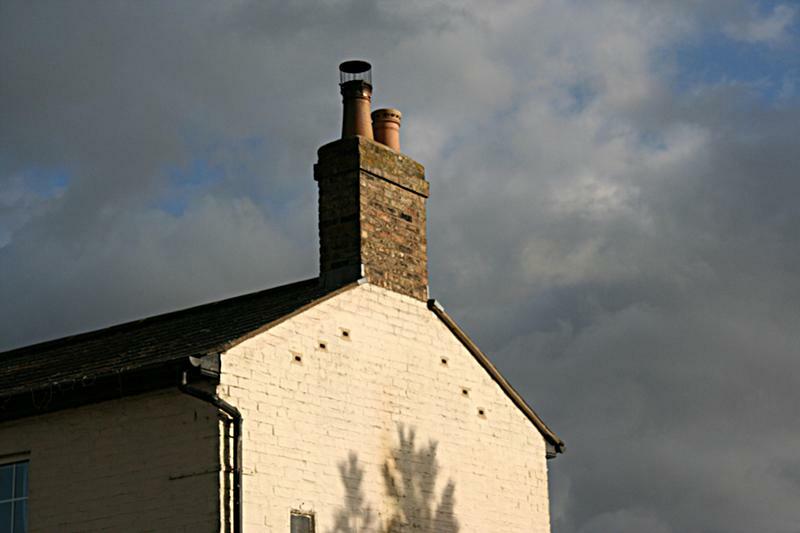 See for example the design on this page at the Concern for Swifts site. So what were the boxes doing there? 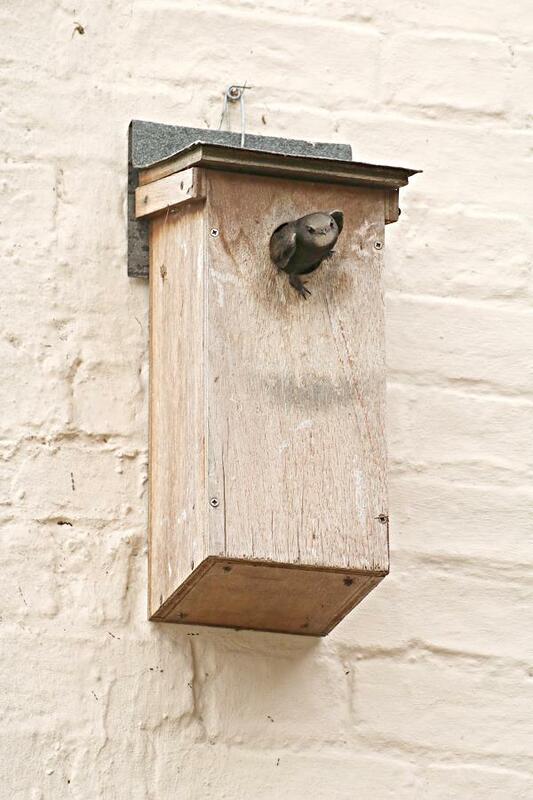 Had the house once had swifts in the roof, and someone had erected these boxes as a replacement after re-roofing? Who knows, but there were no swifts using the boxes now, and I became determined to attract some. During the winter, I got my ladder out and investigated the boxes. Both were completely stuffed with dry grass - probably the work of house-sparrows or starlings. I cleared this lot out (the sparrows won't be homeless - they still get into the roof in other places), and fashioned a new 'anti-sparrow' piece of wood for the entrance on the box that was missing this part. I also bought a new swift nestbox, partly because it came with a 'free' CD of swift-calls which could be used to try to attract them. So that started in (I think) summer 2007. Ever since then, I've been playing the swift-calls from time to time (between say early May and perhaps August) from a pair of small PC-speakers placed near the boxes. 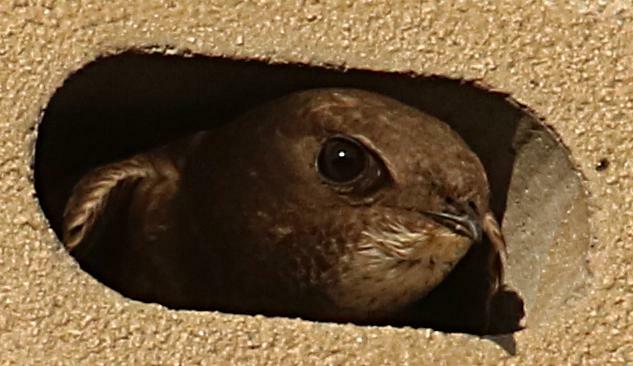 I've always had periods of plenty attention from the swifts, screaming by from time to time, but never saw any of them finding the entrances to the boxes. The nearest I got was one bird that found the entrance to the house window instead just as dusk was falling. I saw it go in and not come out (fortunately, otherwise I might have got a surprise later!). It was just sitting quietly on the floor in the upstairs room, so I was able to pick it up (I used gardening gloves - I read that the claws are very sharp) and set it free out the window again. I read that swifts aren't bothered by human interaction, as was the case here - it just isn't something they normally encounter in their airborne world. 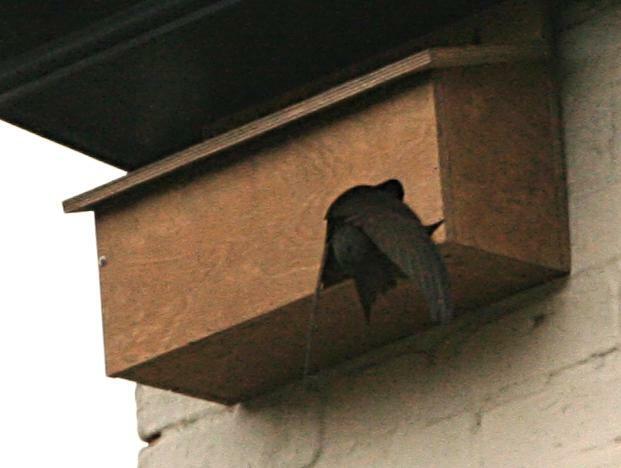 This continued until 2011, when on Saturday July 2nd, I saw a swift confidently enter the hole on the 'new' box. Every day in the week or so since then that I was around, I saw a bird enter and leave several times. I very much doubted that it was a pair raising young in there, as it was late in the season, and surely I'd have seen them earlier. 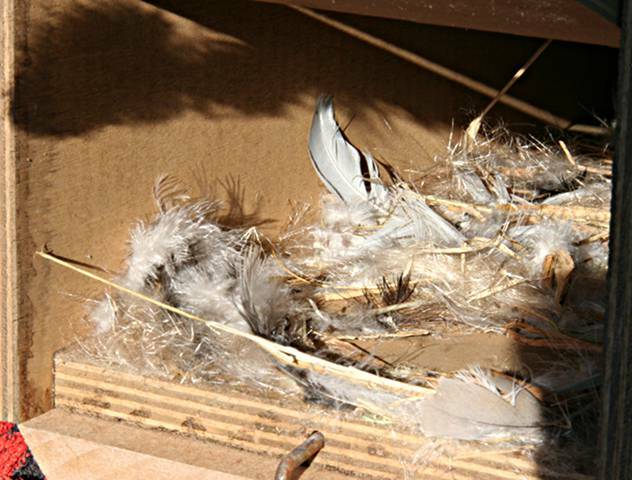 Most likely it was non-breeding bird or pair who had found the box and might breed in it the next year. Later (after the birds have left): it appears they made a start on building a nest (the simple nest remains from year to year), so hopefully they'd be back in 2012 for a breeding attempt. So - finally - some kind of positive results. Ready for the 2012 season, I 'converted' the 'Hirsel' boxes to have an entrance hole at the front, rather than the complicated hole on the end - to more match the 'new' box (seeing as the birds so far haven't found the entrance to these). I added two 'Zeist' style boxes (made by John Stimpson). And I've painted all the boxes white to match the house - although they get some shade from the house eaves, they face south-east, and a white colour might help avoid them getting too hot. 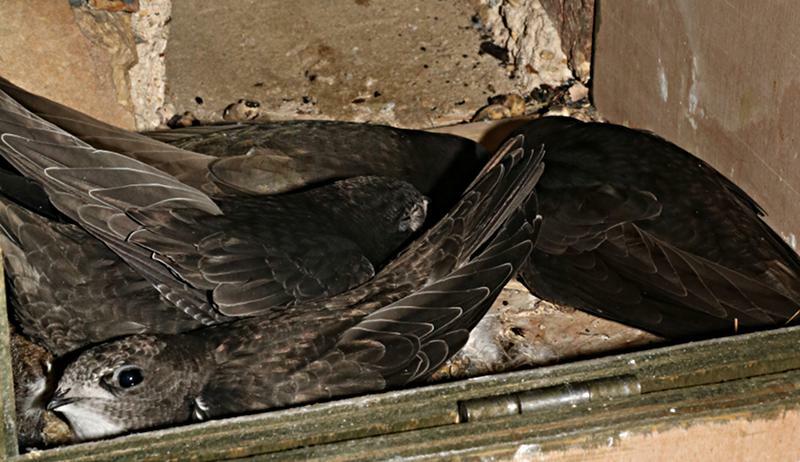 In 2012, the swifts returned, and succeeded in raising at least one chick (possibly two). So, around 5 years after starting trying to attract them, the first young swift has left the (small!) colony. A swift arriving at the box. 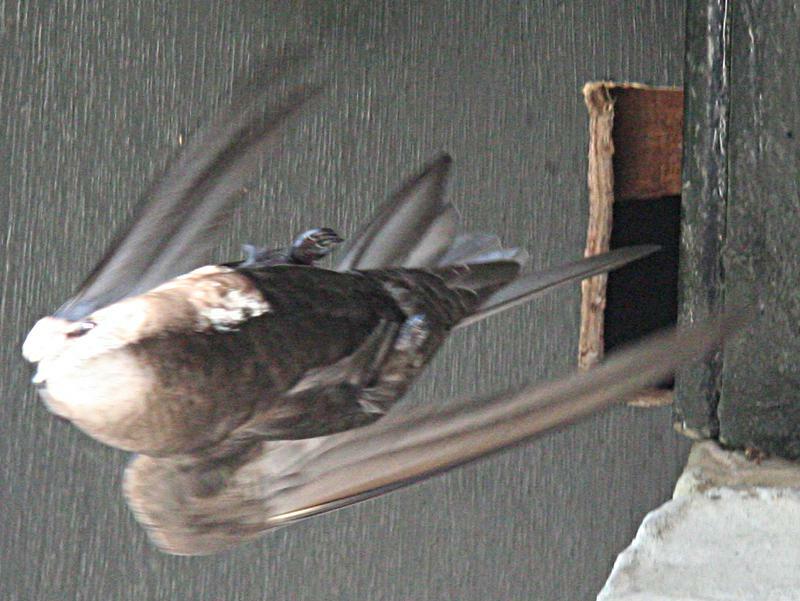 Two swifts attempting to pile through the entrance hole. 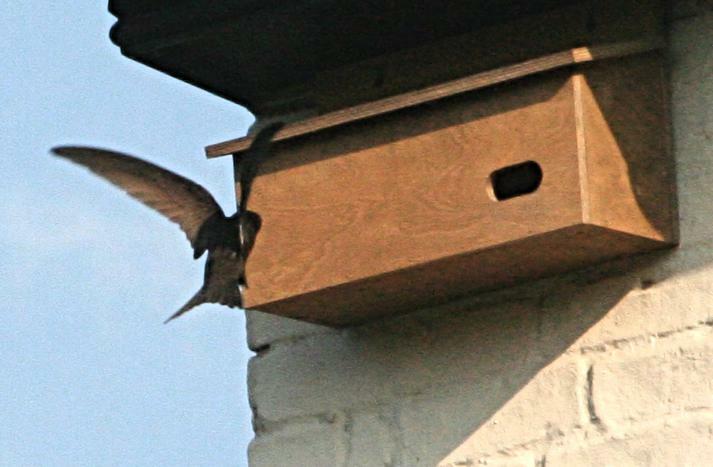 A swift about to enter the box. A swift leaves the box. Once the birds had left, I was able to examine what they had been doing inside. Here is their attempt at nest-building, hopefully in preparation for a breeding-attempt next year. This is viewed from the 'trapdoor' in the box at the left end, i.e. the opposite end to where the entrance hole is. Another view of the 'nest'. The circle nearest the camera with bare centre (so up against the end of the box when the 'trapdoor' is shut) is probably where they would lay eggs, but they have stuck (with their 'saliva') feathers, grass, and fluffy seeds, over most of the floor of the box. It is all stuck together (and to the box) very firmly. I had intended to add a wooden nest 'concave' shape for next year (which I'll do for the other boxes), but perhaps for this box, I should just leave what they've made, rather than disturbing it and trying to re-stick it over the 'concave' - we'll see. Ready for 2012 'swift season': The box that was occupied in 2011 is at the left. All boxes have now been painted white (hope the birds still recognise them); the two 'Hirsel' boxes have been converted to have a hole at the front; and two 'Zeist' boxes (the ones with the opening angled downwards) have been added - these were made by John Stimpson. And yes - that's snow on the roof. When I refer to nestbox numbers on other pages, they are left to right as on this photo #1 to #5. Further to the right (off the photo) are two brick-size boxes, which I call #b1 and #b2. In 2012, a second pair took up residence in one of the holes in the soffit at the eaves of the house. Here's one leaving the hole. The photo is taken from below the downwards-pointing hole. The bird is mainly upside down in the photo (we're looking at its back, even though we're below), but is in the process of turning the right way up. Here is the nest where one young swift (or possibly 2) was raised in 2012. There is a lot more material than last year (see above) when the birds - if it was the same ones - were just making preparations. In the foreground, there is a failed egg (which still seemed fresh, with no obvious embryo, when finally removed months later). Who knows - rejected, infertile, or just fell out of the nest area? New for 2016: Six entrances through the gable end, leading to boxes in the loft-space. I am calling these, from left to right, #g1 through to #g6. 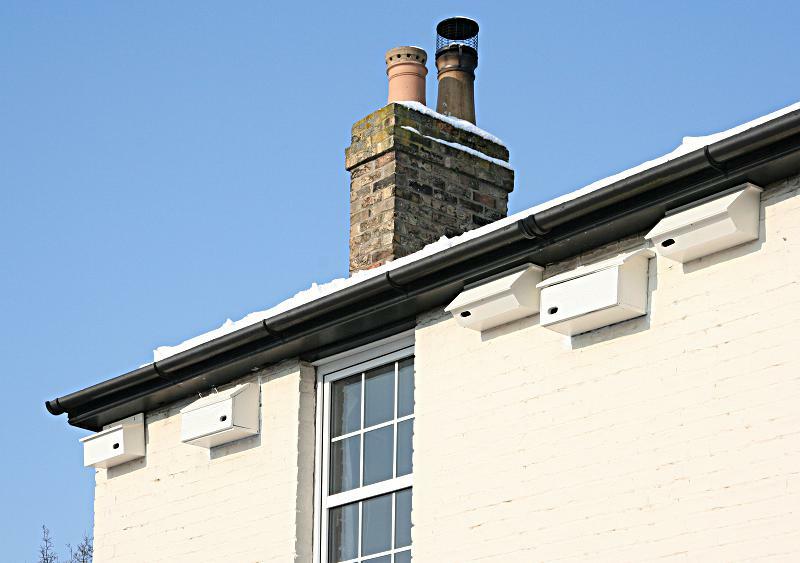 Here is the story of installing these on the Action for Swifts site. Six single 'header' bricks were removed from the brickwork in this single-brick solid wall. 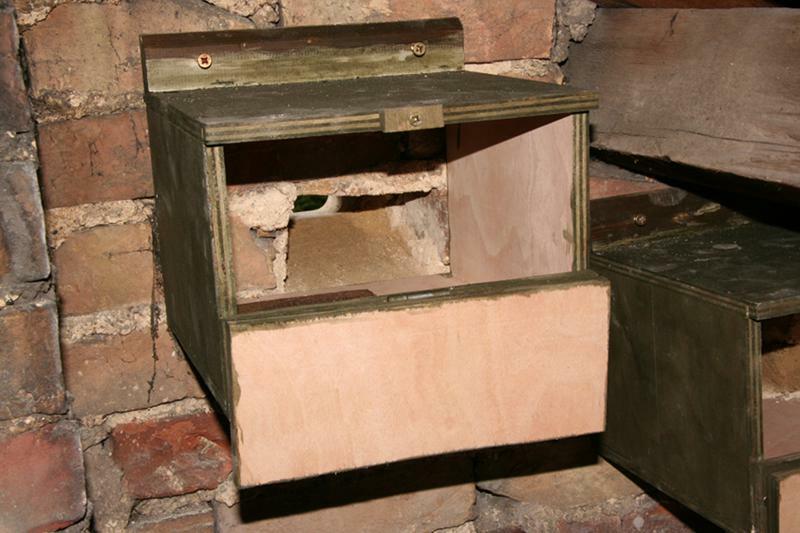 Entrance blocks, cast in a mould from sand/cement, were mortared in, and a wooden nestbox fixed on the inside. Close-up of a single entrance. Next time the wall is painted, all will end up the same colour. 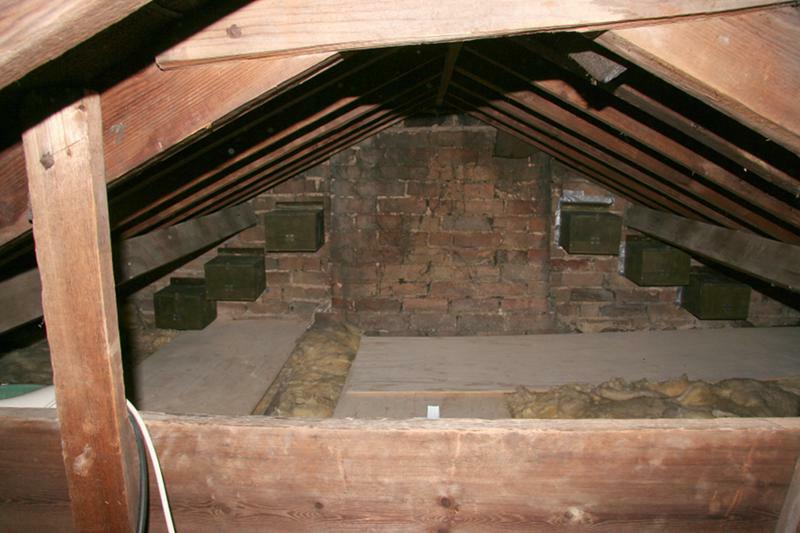 The 6 internal boxes on the end wall in the loft space. The boxes have a hinged back, for inspection purposes. Close-up of a single box with the back open. 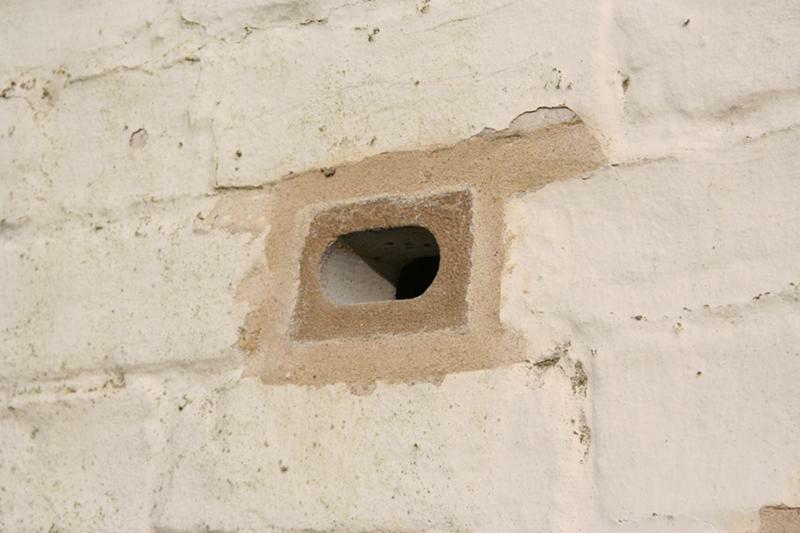 You can just see the nest-concave at left, and the 'tunnel' left by removing the brick leading to the entrance block. The same box as above (#g3) with two swift chicks, estimated to be 15 days old. 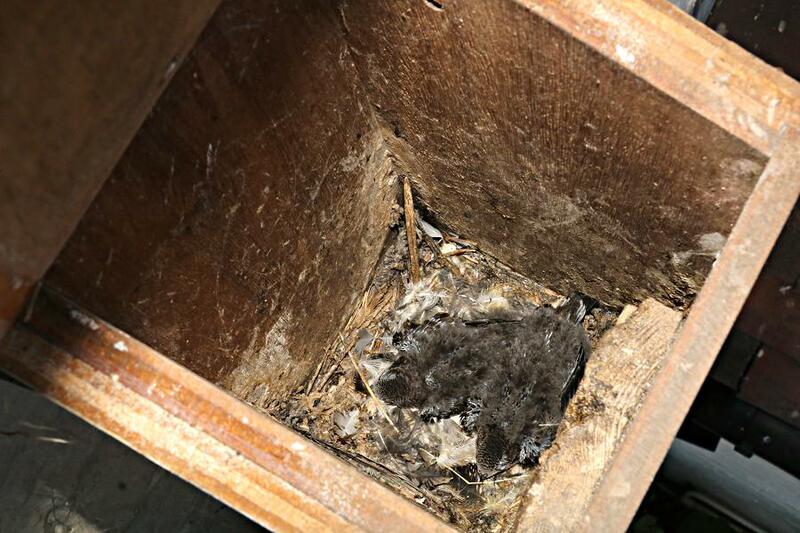 The same box as above (#g3) with two swift chicks, estimated to be 28 days old, and the two parent swifts. Here are the two chicks in box #g3 on 18th August 2016, estimated to be 41 days old, so likely just 1 more day to fledging. An adult swift looking out of gable entrance #g3 - still two young ones inside. 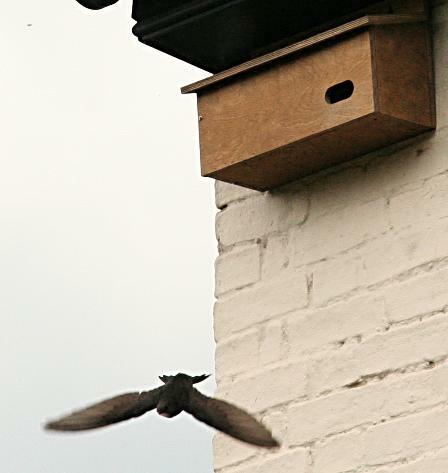 An adult swift leaving 'starling' box #sb2. 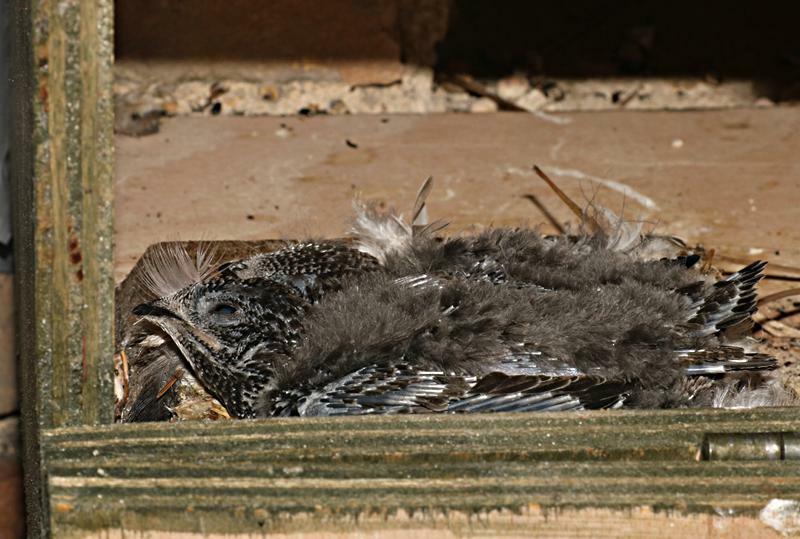 At this time, the swifts had 2 eggs, which hatched about a week later (see below). This is a purpose-built nesting box for starlings (Sturnus vulgaris), and has been used by starlings each year since I put it up. It wouldn't normally be considered satisfactory for swifts: it has a circular hole 45mm in diameter; a floor area of 13x15cm; and from the bottom of the hole to the floor of the box is 23cm, reduced by around 5cm by the old starling nest in the bottom; and it's only about 3.5 metres above the ground, with a fairly obstruced flight-path. Some rough wood is fixed to the inside front, from the floor to the hole, to help swifts climb (I think one got stuck in here a few years ago - I 'rescued' it). As I've written elsewhere, swifts 'claimed' this box late in the 2017 season. Over winter, I moved it lower down for the starlings to use (which they did). In time for the arrival of the swifts, I put a new 'starling' box in the original (higher) place. Initially the swifts were going in and out of the new box, but not long after the starlings left, they moved over to the original (lower) box. 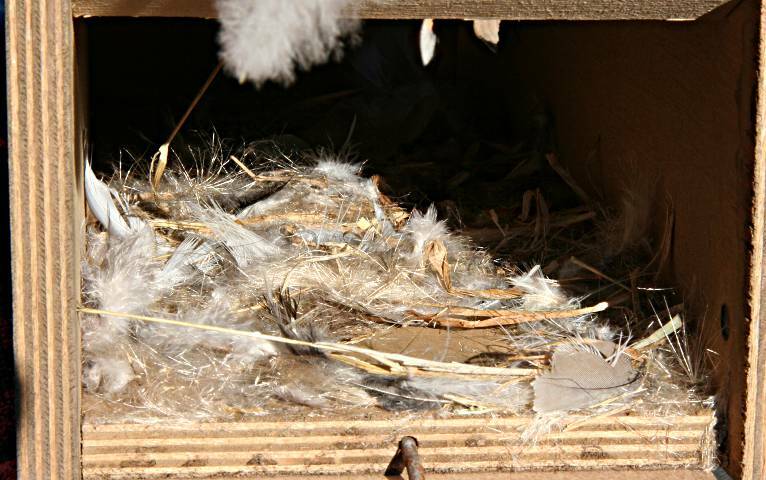 Two swift chicks in 'starling' box #sb2, about 16 days old. 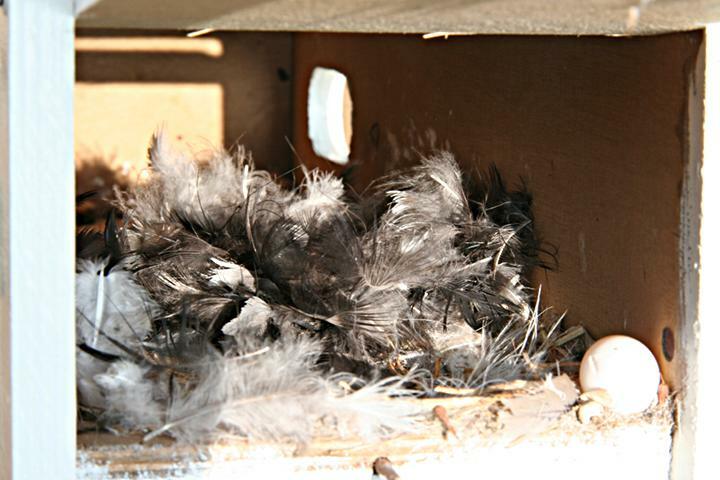 At the bottom of the box, there is the starling nest (used earlier in 2018), with a few feathers added by the swifts. The 'front' of the box is at lower-right in the photo. The top of the piece of 'rough wood' is visible, attached from the floor to just below the entrance hole, to help the swifts get a grip to climb.